With 202020 vision enhancing the awareness and the importance of increasing green space, and new research and technology now allowing green life in fall zones, playgrounds are about to become a greener solution. 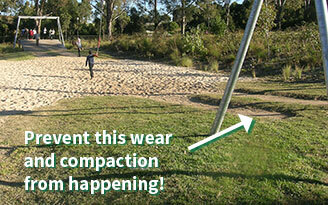 ^ Prevent compacted ground like this in playgrounds by using Living Soft Fall™. Until recently fall zones in playgrounds were not allowed to utilise live plants and turf. Now new testing has shown that certain live plants and turf meet fall zone requirements of the Australian Standard AS/NZ4422:1996. Plants grown in soft fall mulch had a minimum Critical Fall Height of 3.4m and turf grown in Living soft fall had critical fall height of 4 metres, which is far superior to industry standards, and requirements of playground equipment manufacturers. Keeping kids safe has meant high regulation of surrounding surfaces adjacent to playground equipment. Up until now, only non-green life technologies have bothered to undertake the expensive testing to confirm whether those surfaces meet fall zone requirements. For example for swings this often means surfaces must be safe for kids to fall 2.2 metres. Recent research has resulted in Critical Fall Height reports which prove that certain green life is safe and complies with the Australian Standard, which now allows green life to be used in playground surfacing. 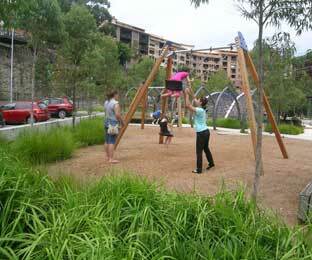 The use of plants in playground surfacing has won a KidSafe award for Innovative Design Elements. Prior to this research only mulch, artificial turf, and a various array of rubber type products met the standards. Landscape Architects and Designers have embraced the 202020 vision, to increase green space by 20 percent by 2020. Now that live plants and turf are allowed again in play grounds, they have another tool to increase the percentage of green life in the landscape. Increased green life has the obvious advantages of cooling our cities, increasing oxygen production, and the increase in health and wellbeing of people. Green infrastructure enhances the healthiness, liveability and sustainability of urban environments. Many studies around the world have confirmed the benefits to humans of being in touch with nature, so why have our children in playgrounds been ignored until now? 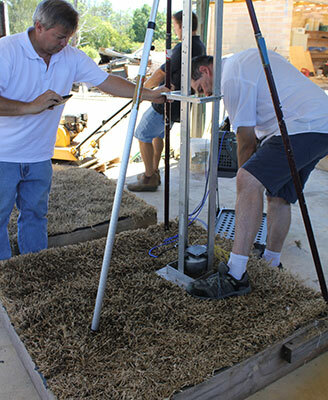 ^ Drop testing on the Tanika® plant. Basically there has been no financial interest in having green life certified as a viable playground surface. It is a costly and time consuming process, with most certification being done by the manufacturer of playground surfaces. It has been in the domain of private enterprise to have their products certified. Profit margins on plants and turf are far lower than other surfaces, so they have been largely ignored until now. Children who are exposed to scenes of nature while exercising are more likely to experience health-enhancing effects after activity, according to a Coventry University. The researchers found that after the ‘green exercise’ the children’s post-activity blood pressure was significantly lower than it was without the natural environment, indicating that the nature scenes promoted positive health effects including lower blood pressure and hypertension. Many other studies have found health benefits associated with children and nature. In developing guidelines for playground surfaces, authorities need to not only take into account the physical safety of children but also the mental and physical wellbeing of kids. 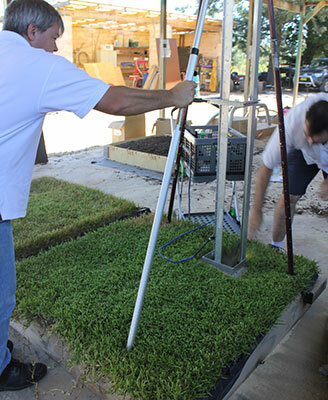 ^ Testing Living Soft Fall™ with live turf. Luckily now both can be achieved using safe green surfaces for playgrounds. Ozbreed, in conjunction with Fiona Robbé Landscape Architects, The Hills BARK BLOWER and Acousto-Scan investigated planting techniques to use when incorporating non-woody plants within the surfacing around play equipment. The research found that plants (especially soft wooded plants) can successfully be grown in mulched fall zone areas in playgrounds and meet standards associated with playground surfacing. In other research turf with specialised underlay has been shown to be safe at a CFH up to 4 metres. Although most heights in play grounds require up to 2.2 metres, it shows how safe turf can be with the right subsurface. ^ Testing Living Soft Fall™ with dead turf. The specialised turf underlay called Living Soft Fall™, is comprised of a media made up of stabilised organics and a soft rubber carbon polymer, ideal for growing turf on. Live turf is safe even on a hot day, and a child will not burn their feet. A child is at risk of a burn when a surface exceeds 50°C. Rubber surfaces can reach above 60°C on hot day according to Kidsafe. Recent research on a 40 degree day showed that turf was 45.65°C, whilst artificial turf was 66.95°C. Wood mulch was 64.15°C in the full sun. 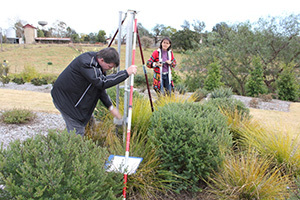 Temperature readings were reduced by up to 23°C adjacent to Lomandra plantings when compared to surfaces without any plants. This research not only has implication for the fall zone in playgrounds, it will make areas outside the fall zone safer and more flexible. Kids playing on lawns or around plants in general can be kept safer, additionally it will allow child care centres more flexibility in moving portable equipment around turf areas outside the fall zone. Increased green space is critical for the health of our cities and the physical and mental health and wellbeing of the population. Now the population can also include children exercising in and around play grounds.